Manila, Philippines - The March 2019 Licensure Exam for Teachers (LET), topnotchers and top performing schools for Elementary and Secondary level will be available here on this page. 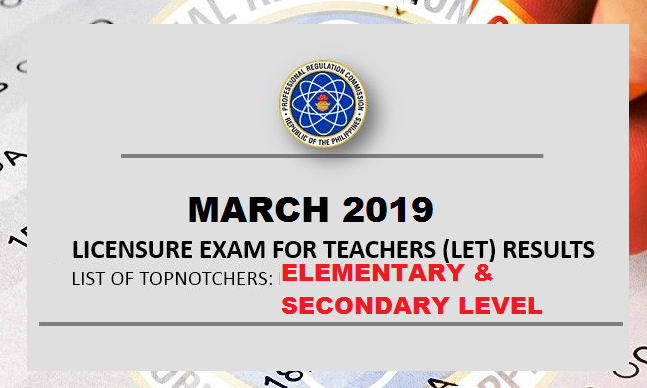 The Professional Regulation Commission (PRC) conducted the LET exam on March 24, 2019 and at we are expecting to release within two months after the exam. The testing centers includes Bacolod, Cagayan De Oro, Baguio, Cebu, Catarman, Davao, Iloilo,General Santos,Kidapawan, Legazpi, Lucena, Manila, Pagadian, Pampanga, Romblon, Rosales, Occidental Mindoro, Tacloban, Tuguegarao, and Zamboanga. The Board for the Professional Teachers are Dr. Rosita L. Navarro, Chairman; Dr. Paz I. Lucido, Vice Chairman; Dr. Paraluman R. Giron and Dr. Nora M. Uy, member.